If you go with your Lagwagon ticket to this concert, you'll get a poster signed by Joey Cape! Don't miss the chance!! Randal Joseph "Joey" Cape is an American singer, songwriter and producer. Active since 1989, Cape is best known as the frontman of the California punk rock band Lagwagon. Cape released his first solo album, Bridge, on October 21, 2008 on Suburban Home Records. His second album Doesn't Play Well with Others, was released on February 2011, after he released each song on the album each month of 2010, collecting them all on CD and vinyl in the end of 2010. In addition to his work with Lagwagon, Joey Cape was the lead vocalist for the experimental band Bad Astronaut until they disbanded due to death of drummer Derrick Plourde and is also a guitarist in the cover band Me First and the Gimme Gimmes. 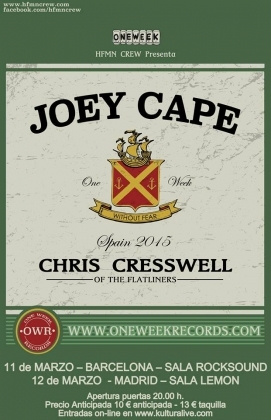 In addition, Joey Cape released two split albums with Tony Sly of No Use for a Name, featuring acoustic versions of Lagwagon and No Use For a Name songs. Both Cape and Sly also contributed one unreleased/new song to the split. Cape's was titled, 'Violet', a song written for his daughter of the same name. He has also contributed a song called 'Minus' for the album Protect: A Benefit for the National Association to Protect Children.